We’d love your help. Let us know what’s wrong with this preview of Shadow People by Jo Robinson. To ask other readers questions about Shadow People, please sign up. It has been a while since I’ve read a sci-fi novel which I really enjoyed, mainly because it is hard to create a world and characters believable enough for the book not to become a laughing matter. The author of this one has balanced outlandish creatures, a new, strange, world, and technology which is real enough not to be thrown off by while reading the mind blowing adventures. She also weaves in metaphysical elements into the story, but in a way that makes sense, because it is in essence about It has been a while since I’ve read a sci-fi novel which I really enjoyed, mainly because it is hard to create a world and characters believable enough for the book not to become a laughing matter. The author of this one has balanced outlandish creatures, a new, strange, world, and technology which is real enough not to be thrown off by while reading the mind blowing adventures. She also weaves in metaphysical elements into the story, but in a way that makes sense, because it is in essence about the ongoing battle between good and evil. Each and every action and reaction is neatly connected and leads us deeper into the story. At first it reminded me of Avatar, but soon enough the author led me away from that thought by the way she gave her characters and worlds a signature of their own. The only downside I can find is that however we know it all ends well, the author could have worked out the end a bit more. Don’t get me wrong the end is very satisfactory, but seems ‘rushed’. All in all I am not a real fan of serialised novels, but seeing this is a stand-alone novel and we can either choose to read the next one or not, I will want to read the next one to. Because being honest, I want to know how the main character solves her next task. The author has incorporated so many genre in this story, the only way it can be described is by putting it into a class all of its own - Paranormal / Supernatural / Metaphysical / Science Fiction / Fantasy (PSMSFF). Far from being a mishmash, it is skilfully written, with a well planned start which feels creepy (like a haunted house is creepy), then a dimensional leap (literally) finds the heroine and TWO muscular men (forget a love issue, it's not going to happen - with them at least), discoveri The author has incorporated so many genre in this story, the only way it can be described is by putting it into a class all of its own - Paranormal / Supernatural / Metaphysical / Science Fiction / Fantasy (PSMSFF). Far from being a mishmash, it is skilfully written, with a well planned start which feels creepy (like a haunted house is creepy), then a dimensional leap (literally) finds the heroine and TWO muscular men (forget a love issue, it's not going to happen - with them at least), discovering a world that sounds familiar enough to science fiction fans, but the denizens they meet will have supernatural horror AND fantasy fans leaping from their chairs! Metaphysical aspects? - read the book, even theology fans / critics get their share of the action. A wonderfully encompassing, gripping read you will grudge spending time away from to eat, sleep or drink, so settle down with food, drinks and a blanket and prepare to be well entertained. Very good! Fantasy/Sci-fi/Paranormal, this one has it all. It was well written with very good character development, and it held my interest all the way through the book. A heroine who turns into a dynamo is always a good thing. I will be looking for more of Jo Robinson’s books. Shadow People (The Finding) by Jo Robinson is a really well done science fiction/fantasy. It has colorful, imaginative descriptions with complex characters. I was please with the strong female lead, but her strength was derived from the weakness of the men. That was disappointing, but the story line is strong and consistent. Robinson created some really nice worlds through the solidly descriptive language. I received a free copy of this ebook in an online give-away. In Shadow People, Natalie (who is extremely wealthy and runs her own deli business) and her husband Gabe (who is also extremely wealthy and loves anything that smacks of paranormal) have bought a new house. Aw, heck, it's a mansion. While puttering around in the basement home theatre, Gabe discovers a hidden room full of weird technology equipment and decides to break down the wall behind to see what strange activities the former owner I received a free copy of this ebook in an online give-away. In Shadow People, Natalie (who is extremely wealthy and runs her own deli business) and her husband Gabe (who is also extremely wealthy and loves anything that smacks of paranormal) have bought a new house. Aw, heck, it's a mansion. While puttering around in the basement home theatre, Gabe discovers a hidden room full of weird technology equipment and decides to break down the wall behind to see what strange activities the former owner, Lauder Shelty, got up to. He discovers a labyrinth of caves and caverns he believes to be a movie set, but will soon be revealed to be a kind of wormhole to a parallel universe. Gabe hires an electrician, Adam, to string lights so they can find their way around the labyrinth and while the men are working down below, Natalie researches Shelty, and discovers his journal where he describes a creature exactly like the one she dreamt about -- a demon that was begging her to let him in! As she rushes to show Gabe and Brian what she has found, the house shakes with the most incredible power surge, with flashing lights, quaking, a wild wind, followed by "an almighty crash, and she felt as if she were being thrown around like a doll in a tumble dryer". And before you know it, Natalie, Gabe, and Adam are transported into space. They find themselves in a spacecraft on an alien planet, Lapillus, "in the middle of space in some far off galaxy" where they encounter a variety of creatures, some benign, gigantic, winged dragons, some arrogant, chicken-like beings, and, at night, demonic, wraith-like dark beasts emerge that, according to carvings the humans have found in one of the great buildings on the planet, would like nothing more than to submit them to unspeakable torture which would ultimately end in grateful death. In a tale full of powerful crystals, the art of invisibility, reincarnation on "the wheel", and the end times struggle for souls between good and evil from many cultures and universes, one of the humans will have a role to carry that is both daunting and essential if Earth and the planet Lapillus are to survive. Jo Robinson transports me to worlds that she knows intimately, and that are completely unfamiliar to me. This book moved me to a mythical fantasy world. I have a hard time getting into fantasy. I have a hard time conjuring and relating to bird beings that aren't birds, horse-like beings with wings, and other mythical creatures that I am not previously acquainted with, especially when they have fanciful names that I can't keep straight. I took notes, and studied them, and still could not remember who was who in the foreign land. One fantastic character whom I was able to visualize was Voxavi. Jo described him in a way that stuck with me. I could see him vividly, even though I could only vaguely see the other fantasy characters. However, even though I didn't absorb parts of the story, I found it absorbing overall. She gave me a vivid image of each place. I caught the visual details of the action scenes clearly; the movement was as logical as if it occurred on a chess board. She clearly presented the complexity of the story, which is intricate with detail and reality warps. I regret that I didn't get to know each character as well as I would have liked, but I did not feel like this caused me to miss a significant part of the story. Beyond the mythical fantasy characters, or should I say, along the way to them, the main character finds that she is able to communicate with a creature whose species was extinct and had reincarnated as spaceships. Thanks, Jo for stretching my sense of the possible. I especially liked that she described their space transportation as "more of a transference than a trip." I also admire the way that her human characters learned to remember previous lives in remote places, and harmonize those memories with their awarenesses of their current states. I did not like the Creation Story that this book included. Its emphasis was on a masculine God that was overpowered by evil. What really impresses me about this book (and my conversations with Jo) is that she persuades me that each element is potentially realistic. Her literature is not about the wild stuff that my friends and I came up with in elementary school. She is a scholar who thinks outside the box, and lets her imagination go as far as it wants with "What if..." based on cutting-edge science hypotheses. Natalie and Gabe are a young couple who have recently purchased a house. The husband discovers mysterious panels in the basement and decides to remove a wall. Strange findings, Google searches on the previous owner, parallel universes, unexpected creatures, and I was sucked into the story. It turns out some of the characters aren’t even who they thought they were. I’ve a confession to make. I do not read science fiction or fantasy, but I gobbled every word till the end. The cast of characters is d Natalie and Gabe are a young couple who have recently purchased a house. The husband discovers mysterious panels in the basement and decides to remove a wall. I’ve a confession to make. I do not read science fiction or fantasy, but I gobbled every word till the end. The cast of characters is diverse and unusual, but I forgave them their oddities. Good news when you’ve read this one, it’s only the beginning and Book 1, The Finding. More adventures are yet to come. Be prepared to be distracted, but in a good way. "Shadow People" by Jo Robinson is a remarkable book that begins as intriguing mystery about the purpose of a suddenly discovered room. Natalie and Gabe are fascinated by it but at first they put the discovery down as a product of the excentric nature of the previous owner of the house. However, the purpose of the room soon becomes clear and our heroes travel to another world and learn of a serious thread to the entire universe. 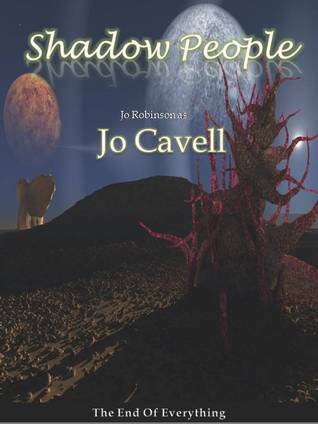 Science Fiction, dark fantasy and great suspense blend together in an "Shadow People" by Jo Robinson is a remarkable book that begins as intriguing mystery about the purpose of a suddenly discovered room. Natalie and Gabe are fascinated by it but at first they put the discovery down as a product of the excentric nature of the previous owner of the house. Science Fiction, dark fantasy and great suspense blend together in an exciting adventure that is well paced and turned out to be a compelling read for me. The creatures and the other world come off well, the ideas are original and very enjoyable. A strong start to a promising series. Shadow People is an exciting adventure into other worlds when a young couple purchase a house and find a hidden room. This strange room is a wormhole to other dimensions. They venture forth and meet alien beings and realize that they are connected to these aliens in ways too hard to comprehend. The couple who go on this adventure, Natalie and Gabe, find themselves and their world in great dangers from evil forces. They must draw power and strength from their past to survive. There is more to this Shadow People is an exciting adventure into other worlds when a young couple purchase a house and find a hidden room. This strange room is a wormhole to other dimensions. They venture forth and meet alien beings and realize that they are connected to these aliens in ways too hard to comprehend. The couple who go on this adventure, Natalie and Gabe, find themselves and their world in great dangers from evil forces. They must draw power and strength from their past to survive. There is more to this story than just aliens and good over evil. The author weaves a little mysticism and spiritualism into the tale that will keep the reader thinking long and hard after finishing the story. This is book 1 and just the beginning of more exciting adventures to come. I live in South Africa with my three feathered owners. I love all animals, champagne, chocolate, any sort of cheese, and most people. I like to read literary fiction, sci-fi/fantasy, and humour most of all, but I've fallen in love with books from most genres at one time or another. I write non-fiction, sci-fi/fantasy and mainstream fiction.